IN the beginning warring gods and demons churned the cosmic ocean, and celestial dancers called apsaras emerged from the froth. That’s one story about Cambodian dance, its origin myth. This tale is preserved in bas-reliefs on the monumental temples of Angkor, created (like the dance) during the Khmer Empire (802-1431), left to become ruins during centuries of vassalage and rediscovered in the 19th and 20th centuries as emblems, first of royal pride and then of national identity. A class in traditional dance at the Khmer Arts Academy in Takmao, Cambodia. The Royal Ballet about 1906, in costumes that are brocaded and bejeweled. They seem to wear temples on their heads. Another story begins in 1975, when the Khmer Rouge, radical Communists, took over Cambodia and restarted the calendar at Year Zero. In the four years before they were ousted by the Vietnamese as much as a quarter of the population perished through starvation, forced labor and murder. Dancers, as symbols of the decadent past, were among those most at risk. According to Toni Shapiro-Phim, a dance ethnologist at Bryn Mawr College who specializes in Southeast Asian dance, only an estimated 10 to 20 percent of the royal dancers survived — about two dozen people who reconstructed what they could of an oral tradition and taught it to new generations. Neither of these stories is the central one advanced by Season of Cambodia, a festival of Cambodian culture taking place around New York in April and May. Initiated by the grass-roots organization Cambodian Living Arts, the festival combines dance performances, films, visual art exhibitions, concerts, classes and discussions. It seeks to shift attention from Angkor and the Killing Fields to contemporary Cambodian art. But this telling of the present inevitably contains remnants of the past. “The Legend of Apsara Mera,” which the Royal Ballet of Cambodia is presenting at the Brooklyn Academy of Music (May 2 to 4), combines the Hindu tale of the apsaras rising from a sea of milk with a love story of an apsara and a foreign prince that is Cambodia’s foundation myth. The Royal Ballet embodies Cambodian classical style: spiritual, serene, very much as if those temple bas-reliefs had come to slow life. Knees bend softly in gliding walks. Toes curl up and fingers bow back toward wrists with the elegance of flora in the wind. Costumes are resplendent, brocaded, bejeweled. The dancers seem to wear temples on their heads. Through stylized mime, the dances recount myths. “The Legend of Apsara Mera” was choreographed by no less than a princess, Norodom Buppha Devi, 70, who was the Royal Ballet’s prima ballerina in the 1960s and lived in exile from 1970 to 1991. As the country’s culture minister from 1999 to 2004 she successfully lobbied to have Unesco place Cambodian classical dance on its register of Intangible Cultural Heritage. Now the name is Royal again, but the company and the art are, in the words of Princess Buppha Devi “still in a fragile state.” The Royal University of Fine Arts, where almost all the dancers train, lost its majestic building a few years ago in a government sell-off. The ballet has become more independent from the Culture Ministry, which means less supervision but also less support. Independence from the state is the trend. The Khmer Arts Ensemble, which is bringing “A Bend in the River” to the Joyce (Tuesday to April 14), formed as a nongovernmental organization outside the capital, Phnom Penh, in 2007. Its artistic director, Sophiline Cheam Shapiro, 46, was in the first class to train at the School of Fine Arts after the overthrow of the Khmer Rouge. She danced with the Royal Ballet and was part of its visit to the Joyce in 1990. 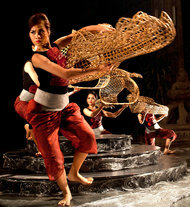 After she moved to Long Beach, Calif., in 1991, she began to apply Cambodian classical technique to contemporary work. 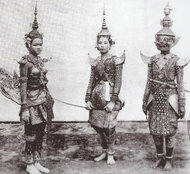 Eventually she returned to Cambodia, experimenting with the state system before forming her own ensemble. Rather than renouncing or abandoning classicism, Ms. Shapiro’s choreography extends it. Rigorously maintaining classical postures and arm and hand positions, her dancers tilt a little further to express intimacy. They might even tangle or intertwine. In “A Bend in the River” classical bodies undulate to convey the motion of a crocodile. The new dance innovates by incorporating materials from contemporary art. The cast moves under and on top of rattan crocodiles by the sculptor Sopheap Pich, whose work is also exhibited at the Metropolitan Museum of Art. Swirling water is suggested by a set of IV tubing. The musician Him Sophy has composed a new score for a Pinpeat ensemble, usually reserved for ceremonies. Ms. Shapiro’s troupe has won acclaim in Europe and America and has tackled “Othello” and “The Magic Flute.” “A Bend in the River” is about a female crocodile that takes revenge on a male crocodile that ate her family. It’s an old fable, but the resonances are more recent. Ms. Shapiro, who was 8 in 1975, lost her home, her father and her two brothers because of the Khmer Rouge. The female crocodile’s anger is her own. Chankethya Chey, who will dance her solo “My Mother and I” as part of the Amrita Performing Arts program at Abrons Arts Center (April 18 to 19), was born in 1985. From the age of 5 she studied classical dance. She trained at the Royal University. She performed with the Royal Ballet. But because of Amrita Performing Arts, a nongovernmental organization started in 2003 to promote contemporary work, she was also introduced to international choreographers and invited to perform abroad. And then she became a choreographer herself. “My Mother and I” is based in classical vocabulary but adds talking, singing and electric guitar to express the struggles of Ms. Chey’s generation. Money is a problem, she said in a Skype interview, as is finding places to present her work. But the greatest challenge, she insisted, is to hold onto the past while moving into the future. “Ten or 20 years from now will every story about Cambodian arts still start with the Killing Fields?” he asked.